While on assignment between 2013 and 2017, often for M decins Sans Fronti res (Doctors Without Borders), Olivier Kugler interviewed and photographed Syrian refugees and their caregivers in camps, on the road, and in provisional housing in Iraqi Kurdistan, Greece, France, Switzerland, and England. 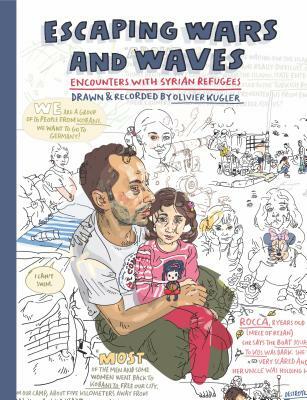 Escaping Wars and Waves is the astonishing result of that record keeping--a graphic novel that brings to life the improvised living conditions of the refugees, along with the stories of how they survived. Kugler captures the chaotic energy of the camps through movement-filled drawings, based on the photos he took in the field, that depict figures, locations, and seemingly random details that take on their own resonance. He also gives precedence to the voices of the refugees themselves by incorporating excerpts from his many interviews and portraits sketched from thousands of reference photos. What emerges is a complicated and intense narrative of loss, sadness, fear, and hope and an indelible impression of the refugees as individual humans with their own stories, rather than a faceless mass. Escaping Wars and Waves is an unnervingly close and poignant look at the lives of those affected by the Syrian war and the doctors and volunteers who tend to them. Olivier Kugler is a reportage illustrator based in London and has won many awards, including a Victoria & Albert Museum Illustration Award in 2011 and a World Illustration Award in 2015. His reportage drawings have appeared in The Guardian, Harper's, Le Monde diplomatique, Port, XXI, and other publications.